This blowfly proboscis is some work in progress that I thought you might be interested in. First image, almost full frame at 10X so subject field roughly 2 mm high. Shot with Nikon CFI60 10X NA 0.25 objective, StackShot focus step 5 microns, 198 frames, Zerene Stacker PMax. 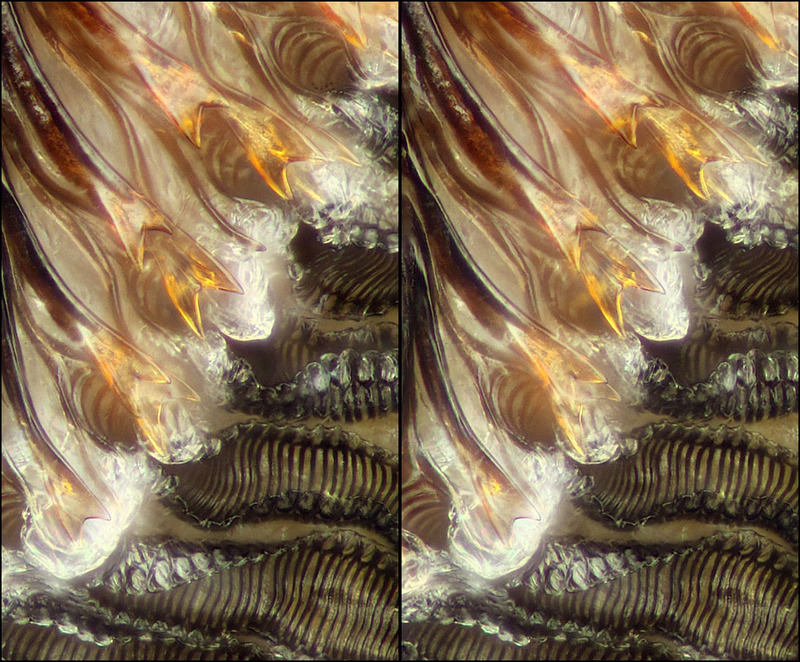 Crossed-eye stereo, most of a full frame at 50X on sensor, about 0.4 mm height. Shot with Nikon CF Plan 50X NA 0.55 inf/0 EPI ELWD (8.7 mm), focus step 1 micron, 113 frames. One thing that interests me about this image is the striking difference in anatomy from what's shown at http://www.sciencephoto.com/media/369670/enlarge. Someplace I've read that some flies have teeth on their proboscis to help rip up meat. Is that what we're seeing here in those long forked structures? Do they tuck down into the groove between the lobes when the proboscis is fully expanded while feeding? Very interesting images. The X50 is a terrific image at such high magnification. I must look at this subject again in a mounted slide of the proboscis. The 'toothed' forked structures will of course be lying flat , but it should be possible to see them, and I can't say I've noticed them before. It would appear to me the fly turns that particular appendage inside out when chomping but for reasons of aerodynamics retracts and tucks it away when not required, as displayed in the SEM image. Those 50X images are outstanding! As the food is +/- liquid, a wet surface might pick up a lot of dust, etc in flight. Perhap another reason for folding it away? Have a look at http://www.biodiversitylibrary.org/bibliography/1160 where you can download B. Thompson Lowne's comprehensive study of blowfly anatomy. It might date from the 1890s, but it is still the best. The book is "The anatomy, physiology, morphology and development of the blow-fly (Calliphora erythrocephala) A study in the comparative anatomy and morphology of insects"
I have located the same area on an old Victorian mounted slide of the blowfly tongue by Amos Topping, and it is an interesting comparison. If you are interested Rik, I could post a couple of images here or in a separate thread. Cactusdave, yes I'd love to see comparable images. Let's put them in a separate thread. That'll keep things straight and make it more obvious how to view side-by-side by opening two browser windows. One more reference is to Tony Thomas's two-part article in Micscape magazine, HERE and HERE (Sept & Oct, 2011). 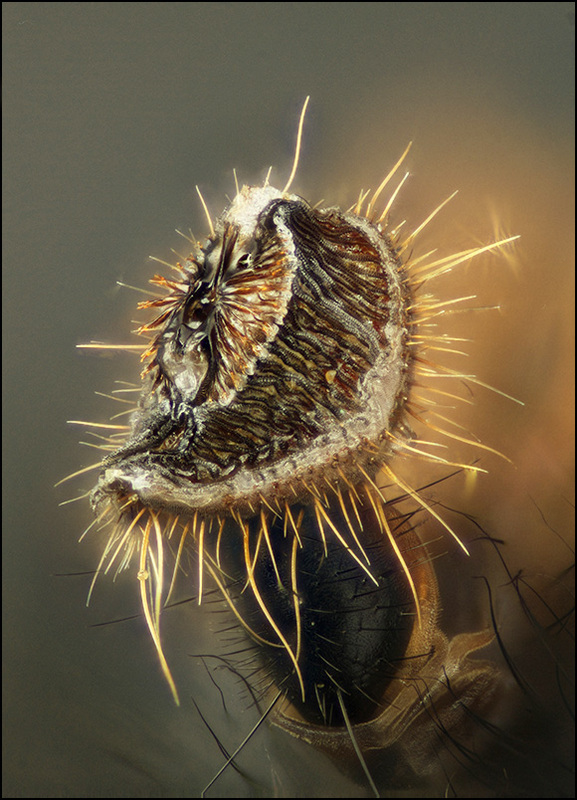 Proboscis photos are in the 2nd part. The prestomal teeth there look much different from what I have and what's illustrated by B. Thompson Lowne. See page 401 in volume 2 for the use of these structures when the fly is feeding on solids. Seems that they help to get the digestive juices into the food. Now, that is impressive observation on the "tongue" of a live fly. When, however, the insect feeds on solids, the oral sucker is applied by its edges to the food, and the pseudo-tracheae distribute the salivary secretion of the lingual glands over the anterior surface of the sucker ; this dissolves the food, assisted, perhaps, by the disintegrating action of the stomal teeth, which, as Suffolk [58, p. 339] remarked, leave lines upon the food material ; and the fluid, with small particles in suspension, is drawn into the oral cavity. Under these circumstances, as I formerly suggested , the pseudo-tracheae probably conduct it into the prestomum and mouth and act as strainers. As an aside, I can't help mentioning that I did not have to re-type those words. The entire document has been very well OCR'd, so all I had to do was copy/paste from the PDF file. The fact that it's OCR'd also means that it's searchable. (What a treat!) However in this case I missed page 401 earlier because I had looked for "prestomal" per the description on pages 144-146, rather than "stomal" as used on page 401. I'm pretty sure these are talking about the same structures though, because searching on "teeth" finds nothing else that makes sense. The index entry is "Teeth of proboscis, 146". By the way, while searching for "teeth" I also ran into page 394, where there is a description of the pseudo-tracheae. The description is accompanied by Plate XXIII, "Details of oral lobes", which contains a couple of nice photographs. The text notes that "The figure is taken from a very beautiful photograph which Dr. H. M. Wright, of Sidney, N. S. Wales, has kindly sent me; it was taken by him with one of Powell and Lealand's latest apochromatic objectives." Pretty dang impressive for a book whose cover page says 1893-95 ! 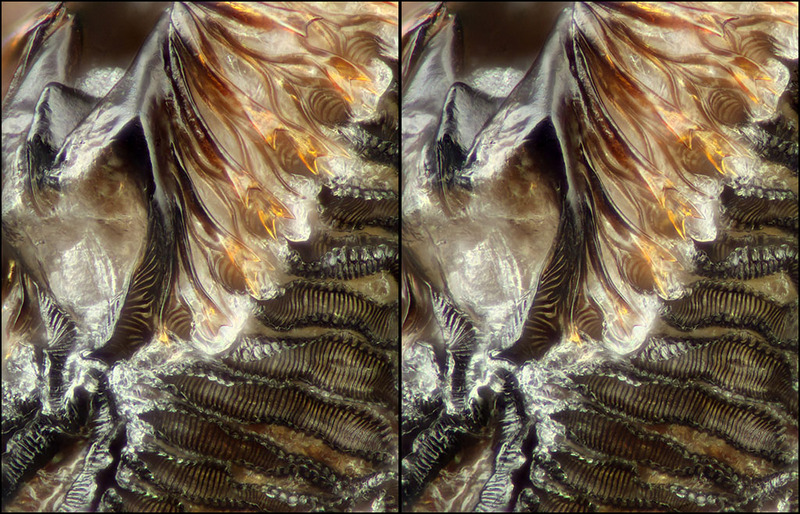 For those who cannot see stereo, here's a small rotating version (animated GIF). This specimen was killed by being placed in a small plastic container in a home freezer. It was kept in the freezer for several days, then removed from the freezer and had some chance to dry (several hours) before all the shots posted above were completed. The proboscis is an erectile organ. It is flaccid and folded on itself when not in use, but is capable of being rendered rigid by the injection of air into the extensive tracheal sacs which lie in its cavities. When at rest the only rigid parts are the fulcrum, the prelabrum and the theca. The two lateral halves of the flaccid stomal disc are folded together, so that the stomal surface is concealed. When the proboscis is in use, it is projected from the head capsule, and rendered stiff by the injection of air into its tracheae. Its varied movements are brought about by the action of muscles; the flaccid proboscis is also folded and withdrawn into the head capsule by means of retractor muscles. So, what we see here appears to be a proboscis in an unnatural position, neither fully rigid from injected air nor fully retracted by muscular action. Still, it's a handy position for seeing the anatomy. The reason I say it's fortuitous "in some sense" is that I collected and treated in the same manner multiple specimens of several species. I was expecting all of them be about equally easy or difficult to deal with, but in fact 6 out of 7 of the blowflies ended up in this position, while almost all of the others ended up in unusable fully folded positions. So really, what's fortuitous is that this highly studied fly happens to die in a position that makes the study easy. At least I assume that's fortuitous -- if the early investigators were particularly interested in the proboscis, then it could be causal! Me too! I once had to do it for the (dissected out) three-level mouthparts of a springtail. 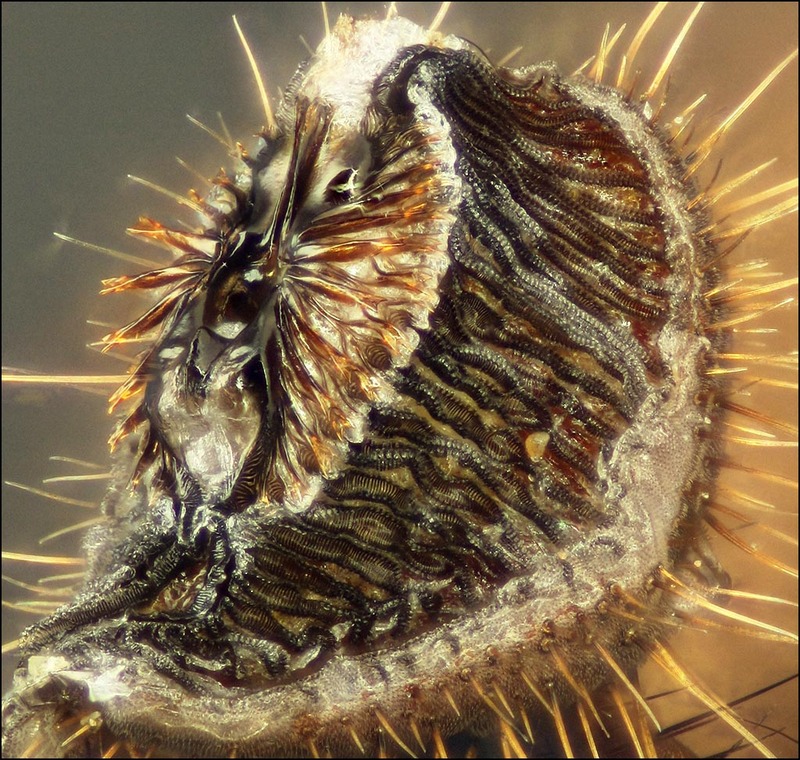 It was the Holotype of a new species I had found and the only entire specimen known and it was in a genus where species are defined by the detail of such structures. These days, when I look at whole collembolan under a microscope, I sometimes struggle to clearly see diagnostic characters and would not contemplate drawing the smaller ones! Love the stereos, another outstanding example where they help so much to grasp the real morphology.